All of your private messages (Email, Facebook, Twitter, Instagram etc.) through a single login. 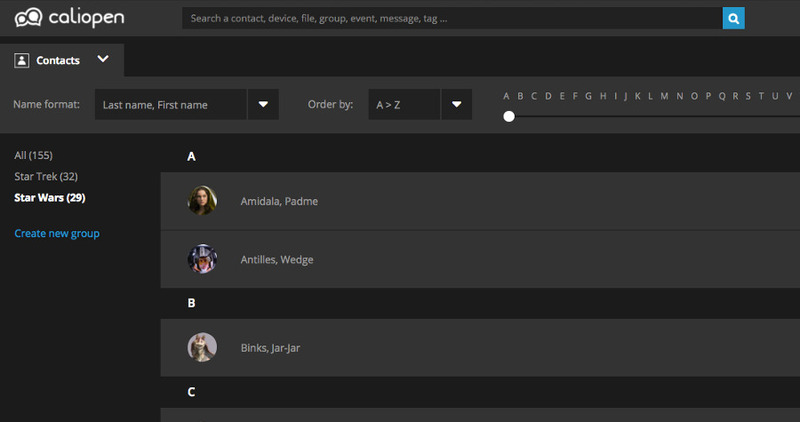 A single timeline, a unified contact list and simplified searches to manage all your private messages. Every search, every filter, every sort criteria defined by the user can be saved and turned into a “View” to be used or paired with a specific device. Every search can include filters and sort functions. All of the unencrypted data can be searched (files included). The user manages the list of the devices used to access their account. Each one of those has different access rights, according to their privacy index. To let you know how much your privacy is exposed, Caliopen shows you the Privacy Index (PI) of your messages. Showing the risk of interception or violation of the secrecy of your correspondence is capital to let you decide what you can share and with whom. 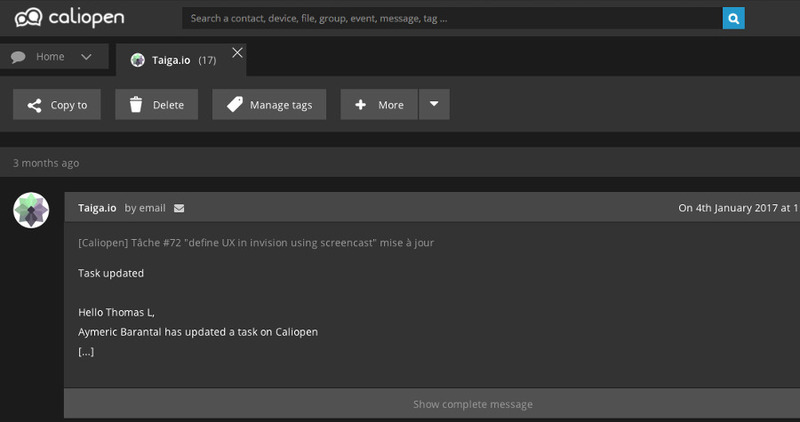 In Caliopen each message, each contact and each user device has an index, and you are shown how to improve it. In Caliopen privacy isn’t all in/all out: it is a mix of different elements, which are technical just as they are behavioural, social and contextual. The PI calculation depends on several variables. Project startFunded by BPI, in partnership with Gandi, Qwant and the “Pierre et Marie Curie” University. 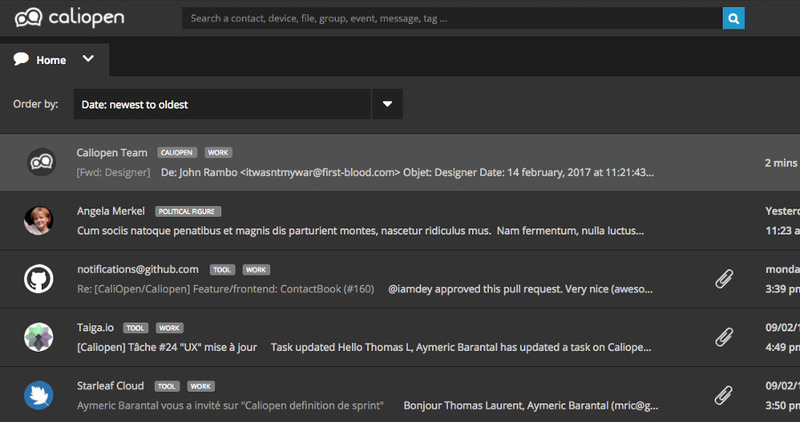 AlphaPublic alpha version, managing emails and a preview of the privacy levels. BetaHandling multiple protocols and the privacy levels. Like every free software, Caliopen needs all kinds of help. To the code, of course, but also to spread the word about Caliopen and privacy, for instance. If you know some conferences or congresses where Caliopen would fit, if you are in touch with groups interested into a presentation, if you wish to host an event, do not hesitate to reach us right away! Product owner in scrum mode, Gandi founder. He cooks macarons to coordinate the meetings and waits for Caliopen to buy Google. To let computers compute, that’s my passion. Making that work to win our privacy back, that’s a mission. Usability expert. Simplicity is the best sophistication (Da Vinci). Backend developer, with ethics, and an open mind. Joking is a serious matter. He’s a JS maker. A metalhead with math/break core tendencies. He never trusts user “‹script›alert(‘input’)‹/script›. And he hates Schrödinger’s codes. To exist, is to survive to impossible choices. Has a diet based on rice, chicken, tomatoes, and user data.